Hier findest du Informationen zu WORKSHOPS, PROZESSEN & STRUKTUREN auf dem Camp. Translations of our ideas on workshops, processes and structures will follow. Traducciones de nuestras ideas sobre talleres, procesos y estructuras serán publicados pronto. Ahora pueden acceder los Informaciones para el Campamento en español. Mittlerweile gibt es die ersten ausführlicheren Infos zum Camp, eine grobe Übersicht über das geplante Programm, sowie eine Seite zur Anmeldung und Infos zu weiteren Camps. 20 years ago, in 1996, the Zapatistas issued an invitation to the “First Intergalactic Encounter for Humanity and against Neoliberalism” in the liberated, rebellious areas of Chiapas, Mexico. And for the first time ever, the invitation did not include organizations and parties of whichever ideological orientation, but the resistant, rebellious people themselves – from across the world! More than 3000 people came together in the Lacandon Jungle. They debated, listened, and celebrated. Many people from Germany also made that journey. They returned full of strength, courage and inspiration, and some decided to link up here – in a network for Solidarity and Rebellion, the Ya-Basta Netz. This summer the Ya-Basta Netz is 20 years old. We’ve given a lot of thought to what might be the best way of coming together and celebrating this occasion. In the end, we came to the conclusion that not only do we want to celebrate, but we also want to keep on walking and take a step forward. The best way to do this seemed to be by an invitation to another Rebellious Encounter. Also in Mexico people are celebrating. 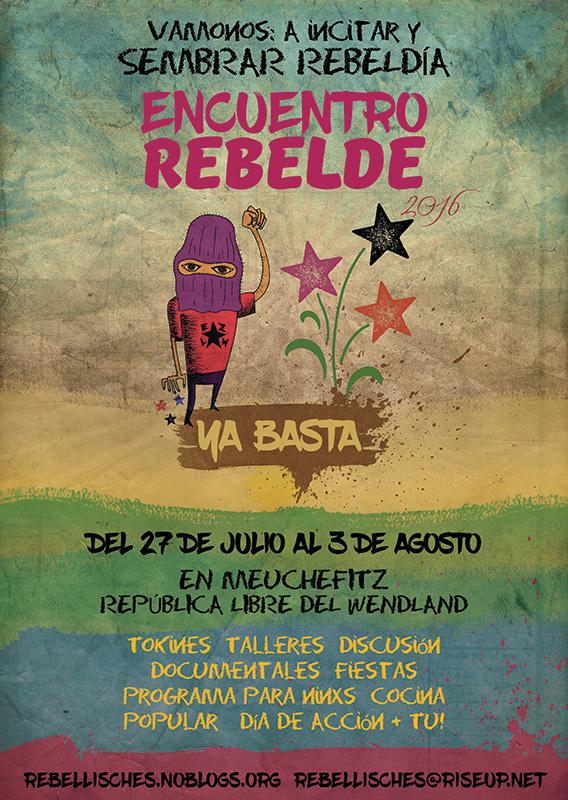 The Zapatistas are inviting to the festival “CompArte por la humanidad” (starting 17/7) and also the Congreso Nacional Indigena is celebrating its 20th anniversary. Our activities here “in the heart of the beast” are in solidarity with struggles there. We understand them as part of a global resistance against this life destructive system. 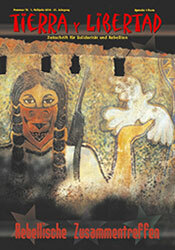 How is the dispossession of indigenous peoples related to tax havens? What does the denigration of Trans*-people have to do with the mass deportation of refugees and dispossessed people? What is the connection between struggles for free urban spaces, and the building of alternatives in rural communes? What does the banking crisis have to do with land grabbing? Where and how can we think about militancy and activism together? These are the questions we want to pose ourselves and which we propose to you, in order to shed light on the diversity of our struggles. This is why it is enormously important to us that we speak honestly with each other, and that we bring out differences in our analyses and our views. To do this we will need the courage to be open and honest towards uncomfortable questions. Together we want to learn from each other by exchanging our diverse views on an equal footing. We want to interweave our views without allowing any one of them to be in a dominant position over any other – so that together they can form a whole. This we propose, because we see that we’re all united in our desire to free ourselves from destruction, exploitation and oppression so that we can live in a world where many worlds and lives fit. For that purpose we need to fight the reproduction and perpetuation of existing power relations and privileges. Patriarchy, racism, capitalism and diverse other expressions of relationships of power and oppression permeate us all, rip us apart from the inside. This means that we want to critically engage with our own perspectives and privileges. But we are of the opinion that nursing a bad conscience helps no-one – least of all those who have to fight for their existence and their dignity on a daily basis. Over the past 20 years and as the Ya-Basta-Netz we have organized ourselves, we have had arguments and have found ways of dealing with them. We got to know the most different and diverse of perspectives and have tried to interweave struggles. We practice respectful interaction with each other and exercise intergalactic solidarity. We put ourselves out there for committed resistance and put our efforts towards the continuous building of alternatives. But this is by far not enough. Therefore we now want to look forward, building on what we have already created. It’s time to prepare ourselves for giving the ruling system a tremendous strike. This is what we want to get together for. This is what we want to talk to you about. Come find us, let yourself be inspired, motivate Others with your questions and successes. Because for hitting the target squarely, we need to take a swing together. The desired contribution per person and day is EUR 5,- for the camp and EUR 7,-; for regional bio-vegan food from Le Sabot. Not having any money doesn’t need to stop you from coming to the camp. To facilitate the participation of as many people as possible we will try to redistribute travel costs in a solidary manner. If you can support us in this, or if you need support, we invite you to contact us. It would be much appreciated if you could leave you dogs at home. There will be young children and people who are scared of dogs. If you don’t have anyone who can take care of your dogs in your absence and this keeps you from coming, please get in touch with us. We will try to find a solution.